Our Lord Jesus, the Greater than Joseph was also tested by the Word of God. The Word of the LORD will refine us also. The refining takes place as we deal with the Appearance of Circumstance versus the Reality of God. When we are faced with what seems impossible odds , will we still trust in His Word? When we are faced with apparent contradiction to what He has promised will we still trust in the power of His deliverance? 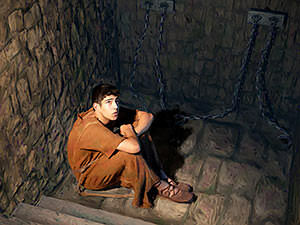 Will we cling to the hope of what He has promised while in the midst of the shackles and irons of life, the refining fires that work through pain and limitation? Let us hold on firmly to His Word which clearly reflects the commitment of God for our highest good and blessing. Will we trust His Word or our perception?